Last October, I wrote a short piece outlining three possible scenarios related to Politburo Standing Committee (PSC) succession at the Chinese Communist Party’s 19th Party Congress, an event which is slated to be held later this year. There were two key ideas embedded in that piece. The first was that Xi Jinping could not afford to simply follow institutional norms with respect to filling seats on the PSC, as such a strategy would likely lead to Hu Jintao affiliated individuals occupying a majority of PSC positions. The second was that the degree to which this year’s PSC succession deviates from institutional norms will depend both on Xi’s political strength and his desire telegraph the extent of his power. Given those two ideas, each of the three scenarios discussed represented a different degree of adherence to/deviation from institutional norms. With the 5th session of China’s 12th National People’s Congress having just ended, now seems like a good time to consider what has happened since the last piece. Three events seem particularly notable. First, at the 6th Plenum of the CCP’s 18th Central Committee held at the end of October last year, Xi Jinping was anointed as the “core” of the leadership of the Central Committee. Second, earlier this year, Shen Jinlong replaced Wu Shengli as commander of the PLA Navy (PLAN). Third, China’s anti-corruption apparatus appears to be in the process of being overhauled. Similarly, the confirmation of Shen Jinlong as PLAN commander is also interesting. 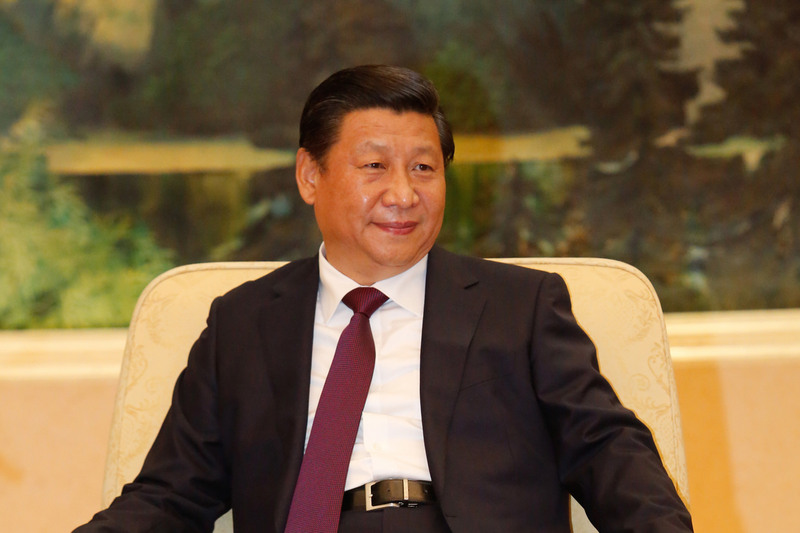 Coming on the heels of a sweeping reorganization of the People’s Liberation Army (PLA) that was announced on December 31, 2015, and news in April, 2016, that Xi had acquired a new title: commander in chief (of the CMC joint battle command center), Shen’s elevation from a deputy military region position to PLAN commander constitutes a jump of two grades in a single bound. As such, the leapfrogging appointment represents a break with traditional promotion rules in the Chinese military. Finally, China seems to be in the midst of a sweeping overhaul of its anti-corruption architecture. In January, the Central Commission for Discipline Inspection (CCDI) announced a plan to merge itself with the cabinet’s Ministry of Supervision and the anti-corruption bureau of the top prosecutor’s office and corruption prevention bodies. Looking forward, it appears that a new National Supervisory Commission will combine the powers of the Central Commission for Discipline Inspection (CCDI) and other graft-fighting bodies and is likely be placed under the jurisdiction of the National People’s Congress. What to make of all of this? Xi’s “core” leader designation, the PLA’s dramatic reorganisation, and Shen’s recent promotion, all seem to indicate that, broadly speaking, Xi is in the driver’s seat and not unduly concerned with institutional norms. More narrowly, the changes in China’s anti-corruption architecture seem to have potentially interesting implications for Wang Qishan’s future. At the 19th Party Congress this fall, it is expected that five of the seven current PSC members will retire (with only Xi Jinping and Li Keqiang being young enough to carry on). Some, however, have speculated that Wang Qishan might stay on for another term despite having reached the traditional age of retirement. If so, based on seniority, that would make him the third-ranking member of the PSC. Given that the Chairman of the Standing Committee of the National People’s Congress (NPC) has often occupied the third slot in the PSC hierarchy (a pattern that remains true today with Zhang Dejiang being both NPC Chairman and the third ranking PSC member), if Wang Qishan’s current anti-corruption portfolio were put under the aegis of the NPC, that would seem to be a strong indicator of an intention to keep Wang Qishan on the PSC for another term (as NPC Chairman). Were that to happen, it seems the door might well be open for Xi Jinping to extend his time in office. If so, there seems to be little reason to appoint any potential successors to the PSC this fall. Perhaps then a smaller Politburo Standing Committee might make sense? Could it be that five is the magic number? If it is, who will be this fall’s fab five? While this is a completely speculative question to be sure, it seems unlikely that an answer can be any less accurate than my NCAA tournament bracket… In that spirit then, let me suggest a PSC starting five of Xi Jinping (General Secretary), Li Keqiang (Premier), Wang Qishan (NPC), Wang Huning (CPPCC), and Wang Yang (First Vice Premier). Of course, a lineup like that does raise the question of who might ultimately succeed Xi. If we look at the current composition of the Politburo, two names jump off the page, Hu Chunhua and Sun Zhengcai, the two youngest members of that body. However, if Xi extends his term through to 2027, successors are expected to serve two terms, and 68 is considered retirement age, then Hu Chunhua and Sun Zhengcai are too old to serve as successors. Now it has often been said that provincial leadership has been an important proving ground for China’s top leaders. If so, one might expect to be able to identify some potential candidates for China’s future leadership among the PRC’s various provincial party secretaries and governors. With Hu Chunhua and Sun Zhengcai already being the PRC’s youngest provincial party secretaries, few hints appear there. 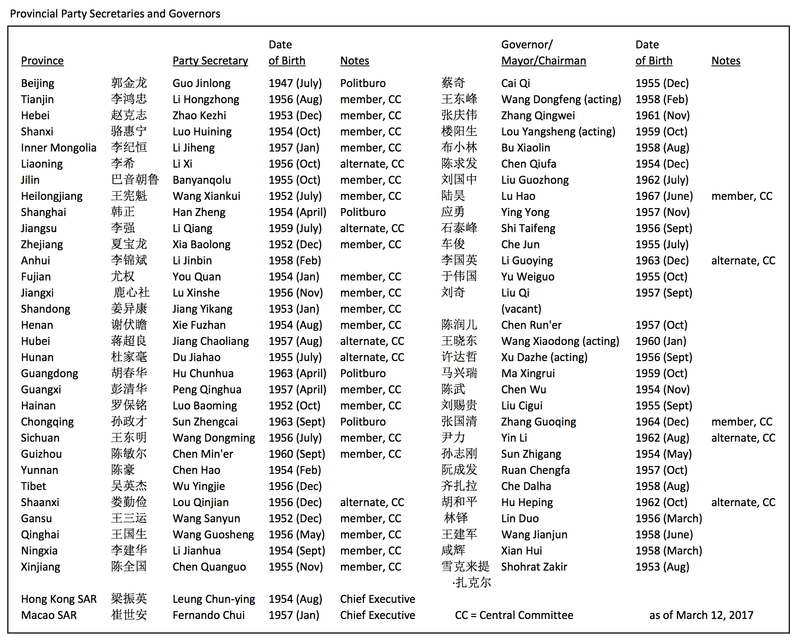 In fact, even looking among provincial governors and municipality mayors (please see table 1.1 below), only one individual (Lu Hao, governor of Heilongjiang, born in 1967) appears young enough to serve as a possible successor. However, with Lu having been identified as being a member of the party’s youth league faction (Hu Jintao’s power base) and having had to deal with a difficult economy and protests, his prospects do not seem exceptionally good. Jonathan Brookfield is an Adjunct Associate Professor at the Fletcher School of Law and Diplomacy at Tufts University and an Associate in Research at the Fairbank Center for Chinese Studies at Harvard. 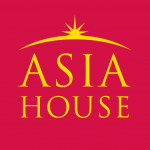 His research covers politics, economics, and business strategy in Asia. Image Credit: CC by Global Panorama/Flickr.